A psychedelic party drug continues to show promise as a treatment option for patients with chronic post-traumatic stress disorder, a new study shows. 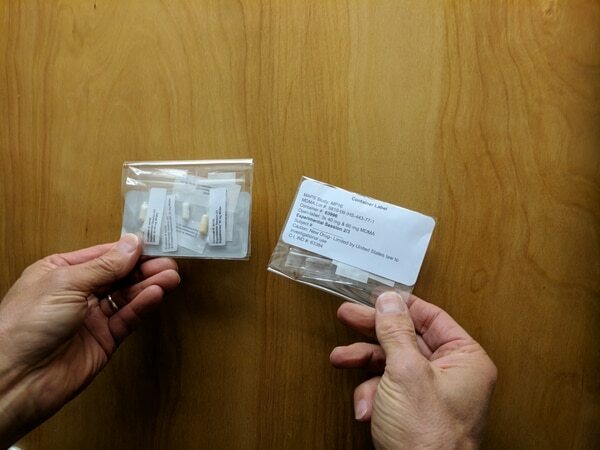 The study, published in the Lancet Psychiatry journal earlier this month, found that MDMA, the main ingredient in ecstasy or molly, dramatically reduced PTSD symptoms in study participants. Doctors treated 26 first responders during two, day-long psychotherapy sessions that featured full doses of MDMA. The majority of the study’s participants were combat veterans. Accelerated resolution therapy requires fewer sessions than traditional treatment and doesn’t require patients to talk out loud about their experiences. That's why, researchers say, it can be particularly appealing to service members and veterans. Treatment with MDMA has the capability to “reduce fear and defensiveness, enhance communication and introspection, and increase empathy and compassion, enhancing the therapeutic process,” according to a 2017 press release from the California-based nonprofit, Multidisciplinary Association for Psychedelic Studies, or MAPS. MAPS has been researching the effects of MDMA for over 30 years. The continued success marks another step toward reaching Food and Drug Administration-approval status, and the hope is that MDMA treatment can eventually replace antiquated methods that have proven unsuccessful. “At least one in two PTSD patients cannot tolerate or do not respond adequately to existing treatments, so there is an urgent need for better treatments for the millions of military veterans and others with PTSD,” said Dr. Michael Mithoefer, one of the study’s lead researchers. PTSD is nearing epidemic status, especially among veterans of Operations Iraqi Freedom and Enduring Freedom. The Department of Veterans Affairs estimates between 11 percent and 20 percent of OIF and OEF vets suffer from the condition. But Mithoefer believes this type of psychotherapy could help curb that glaring trend. MDMA was given “breakthrough therapy” status in 2017 by the FDA, which noted the treatment “may demonstrate substantial improvement over existing therapies,” the release said. The next phase of testing will begin this summer, and will feature between 200 and 300 participants across 16 testing sites in the U.S., Canada and Israel. Demonstrating significant efficacy and safety in this round of tests is expected to result in full FDA approval by 2021. Since its inception in 1986, MAPS has raised over $47 million for psychedelic therapy, and is only $500,000 away from its $26.7 million goal needed to begin the FDA trials.